NAIROBI, Kenya, November 3, 2016 (ENS) – Civilians in Northern Iraq are suffering suffocation and respiratory illnesses due to what appears to be a scorched-earth policy employed by retreating ISIL militants following the launch of a major military offensive to retake the city of Mosul. A 94,000-member coalition of Iraqi security forces, Kurdish Peshmerga allies and thousands of fighters from various minorities are involved in the operation to free Mosul from more than two years of ISIL rule. Commanders have told reporters the effort could take months to complete. Moving in teams of 12 to 16 troops, U.S. special operations forces are alongside Iraqi and Kurdish Peshmerga forces converging on Mosul from the south and east. The U.S. teams are advising and coordinating with those forces on how to maneuver on the ground, and how to coordinate artillery and air attacks, U.S. officials said. 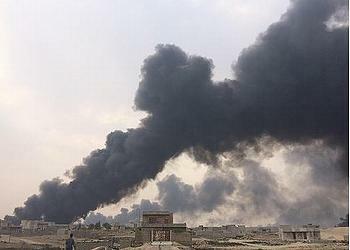 The United Nations Environment Programme, UNEP, based in Nairobi, says 19 oil wells have been set ablaze by armed groups near Al Qayyarah, located southeast of Mosul, with citizens and armed forces alike exposed to the toxic fumes. The burning crude oil produces many pollutants, including soot and gases that cause health problems such as skin irritation and shortness of breath. In late October, stockpiles of sulphur dioxide stored at the Mishraq Sulphate Factory caught fire, sending up a large toxic cloud that spread over dozens of kilometres. Iraq’s Directorate of Health, supported by the World Health Organization, treated over 1,000 cases of suffocation in Qayyarah, Ijhala, and Makhmour primary health care centers. UNEP, through the Joint Environment Unit it runs with the UN Office for the Coordination Humanitarian Affairs, OCHA, put responders in touch with hazardous materials experts, who provided technical advice on dealing with the fire. On October 23 a water plant was reportedly affected by fighting, leading to a chlorine gas leak for which around 100 civilians sought medical treatment. 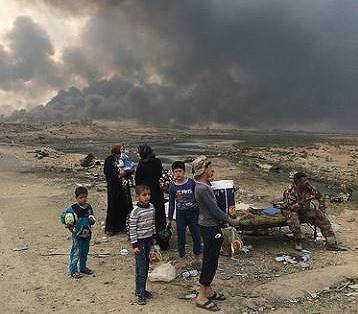 “This is sadly just the latest episode in what has been the wholesale destruction of Iraq’s environment over several decades – from the draining of the marshlands to the contamination of land and the collapse of environmental management systems,” said UNEP chief Erik Solheim. Minimizing the damage to the environment from armed conflict remains a UNEP top priority. The organization is working closely with partners in Iraq like OCHA, WHO and the UN Institute for Training and Research. UNEP is also working with the UN Operational Satellite Applications Programme, which has provided support to mapping smoke plumes during the offensive to minimize harmful impacts of chemical hazards on humanitarian responders. These events show the need to prepare for environmental health impacts as part of humanitarian action and crisis response, a topic UNEP will continue working on, particularly at the 2017 Environment and Emergencies Forum taking place in Nairobi next June. Member states and non-state actors need to take all measures to comply with existing international law on the protection of the environment in times of armed conflict, a responsibility highlighted in a number of UN and UN Environment resolutions. The General Assembly resolution “Protection of the environment in times of armed conflict” urges countries to take all measures to ensure compliance with existing international law that applies to protection of the environment in times of armed conflict. The General Assembly resolution “Observance of the International Day for Preventing the Exploitation of the Environment in War and Armed Conflict” also emphasizes the importance of this topic. Most recently, the UN Environment Assembly adopted the resolution “Protection of the environment in areas affected by armed conflict,” highlighting the role of UNEP to support Member States in addressing these challenges. In a year dominated by the tragedy of war, this is the right time to urgently address the need to protect the environment in armed conflicts, Ambassador Marie Jacobsson of Sweden said today at the Fourth Annual Al-Moumin Lecture on Environmental Peacebuilding in Washington, DC. 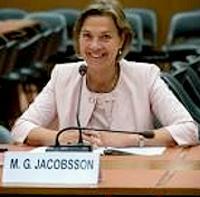 Dr. Jacobsson, the UN Special Rapporteur for the Protection of the Environment in Relation to Armed Conflict and recipient of this year’s Al-Moumin Award, is a member of the UN International Law Commission and a professor of international law at Lund University, Sweden. She told the audience that while states and international organizations have taken steps to prevent environmental harm before and after armed conflict, they have been unwilling to commit to further legally binding rules during armed conflict.